Dr. Louis L. Smith emigrated from England to Australia in the mid 1800's and in 1853 he established a surgery in Melbourne. 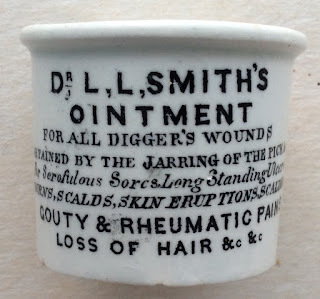 He produced the Ointment for 'All Digger's Wounds sustained by the Jarring of the Pick' among other cures. Unusual wording I am sure you will agree! The pot layout bears a resemblance to the Thomas Holloway style pot, the version with the 244 Strand address. 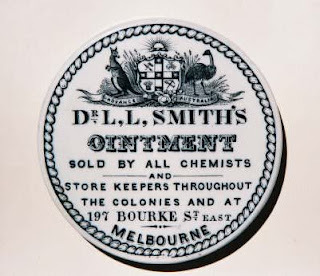 There is also an ointment pot lid as shown in the picture below. All the Smiths products are highly sought after in Australia. Thanks to Michael Marysej (Australia) for the images.